Above were few of the common reasons that most of the people have. Another big reason is – Environment. Below you’ll find a brief explanation about that. The waste created by K-Cup brewing systems has raised many environmental concerns. In response to these concerns, several solutions have been reached. One such solution is a reusable single brew pod and these act like a K-Cup, providing enough coffee for a single cup. However, rather than being disposable, these cups can be washed out and refilled. This means that you only have to purchase the reusable cup once, and then fill it with any coffee at any price. Even when using decent quality coffee, the savings using a reusable cup can be upwards of 50% or more. Not only does this method save money, but it is also far more environmentally friendly and opens a way of using fresh ground coffee. Clean your reusable cup thoroughly so that it doesn’t carries any residue or small of previous brew. Fill the pod with your favorite ground coffee. Some options allow only 10 grams of ground coffee while few allow over 13 grams. If you are looking for just saving money, you can also look at our article about How to find Cheap K-Cups. It tells many ways to save some bucks with few tips and tricks. Here is a video that demonstrates, if you love visuals. With these, one can even brew tea by filling the favorite tea in the filter. A lot can be experimented once you have these. So, let’s not waste much of time and skip to our favorite picks that don’t require any tampering to your machine and are trusted by many buyers. Let us now browse through the best options available in the market that are excellently built and are sold the most. The very first option that strikes is My K-Cup by Keurig itself. The brand also insists on using reusable options as it knows how important is the environment. This product has excellent built quality and is compatible with Keurig 1.0 and 2.0 brewers. It is marked with barcode required by scanner in brewers so no hiccups in compatibility. It even has two measuring lines to optimize brewing further for travel mugs or normal mugs. Overall, a great pick if you are buying this thing for the very first time. If you are concerned about the BPA stuff in plastics, then this one might be your favorite pick. It’s not like other ‘Come N Go’ brands and has been for longer. This option is compatible with 2.0 series and not with the 1.0 models. 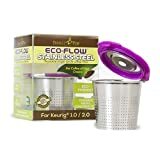 Fill N Save Elite Series Stainless Steel Reusable K Cup, Refillable Keurig Filter for Keurig 2.0 and 1.0. 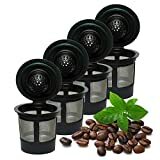 Excellent Filter Replacement to Coffee Pods. New 2018 Model, NOT for use with K55 Machines. The Fill N Save is dishwasher safe and can be even washed easily with water as coffee oil is easy to wipe off with water. It has a specially designed mesh that allows better brewing. Another advantage I missed above was you won’t need any kind of drawer for K-cups as there will be no bulk buying. So, you are saving some space too by using reusables. With Gold comes purity as it doesn’t exhibits any unwanted flavors into your coffee over time. This product has 24K Gold pleated honeycomb mesh that lets brew a great coffee every time. There is no such material used that will affect the taste of coffee. It is compatible with most of the Keurig brewers and the brand specifically says that it works with K200, K300, K400 and K500 series. It is even tagged with lifetime warranty for complete peace of mind. Another product of that comes with quality is ECO-Flow. This product is also built durable and is compatible with almost all 1.0 and 2.0 series brewers. It has perforated holes in the sidewalls for optimal brewing. The coffee will again, taste superior as there is nothing that can affect the brewed coffee. This is actually a set of four refillable K-cups that are compatible with almost all the Keurig brewers. These are sold from long since the concept of reusing the K-cups is born. They fit seamlessly with your Keurig brewers and there is no need for tampering with the unit. The next option in our favorites is the SoloFill K3. It has a patented mesh that is guaranteed not to break. 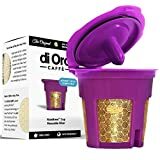 It has a unique piano hinge design with permanent micro foil chrome filter that minimizes the insertion of coffee particles in the cup. It even has a Decaflo spray head that uniquely and evenly spread the water over the coffee for perfect brewing. These are actually not the reusable Kcups but rather the filters to be used in these. To avoid coffee sediments in your cup of coffee, you can use these filters as precaution as these blocks the sediments from passing through the tiny holes of refillable pods. 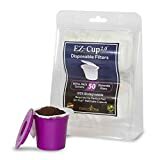 So, above were our favorite picks that you can too use in your favorite Keurigs and save some money as well as land waste to help environment.